Football drills like this one are a lot of fun which is important to keep the players interested especially at a young age. Take a look at the diagram below. The players will be lined up at one end of the grid with only one player (or coach) to the side with a ball. With the young players lined up and ready to go the coach can begin the game. On the word 'GO!' the players will run toward the other end of the marked out area. The coach will pass the ball in the direction of the players and try to hit one of them below the knee. Football drills such as this one will always entertain the young children due to it having a true 'play around game' feel to it. It is a good idea to let all the kids get to the other end first time round and then aim to hit one of them on the next go. Once a player has been hit they will join the coach on the side and be given a ball. All football drills need to teach the players something as well as being fun. In Cowboys and Indians the emphasis is on passing the football. Get all the kids around you and demonstrate the 'ABC' of passing. - 'A' is for 'Approach' with one foot next to the ball. - 'B' is for 'Body' with the players body slightly over the ball and in the correct position. - 'C' is for 'Contact' of the ball using the side of the foot. Get the kids to repeat the ABC of passing regularly in these types of football drills. The game then continues with the coach and already hit player trying to get the rest of the team as they run past. The winner will be the last person remaining. Drills that you have seen on TV or by other coaches can always be modified to suit your team or individual players. There is a really good progression that you can use in this game. Start once more with the coach on the side lines and the players at one end. However, this time the players will have a soccer ball each and have to dribble the ball carefully to the other end. The coach will try to hit the players legs or ball. You could also have the kids dribble down to the bottom of the marked out area and then have to do a turn (drag-back e.g.) and go straight back to the other end. -> Demonstrate clearly the ABC of passing and get one of the players to show everyone else. 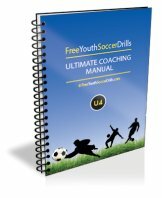 More football drills - click here!